John R. Foran was born in 1946 in Maine. During his childhood he lived in Maine, Massachusetts, Pennsylvania and Maryland . He has been married to his wife since 1968. John and Diane have four children and several grandchildren. His two sons played football at DeMatha Catholic High School and went on to play football in college at Virginia Tech and the College of William and Mary respectively. His two daughters graduated from St. Mary's High School in Annapolis and played basketball and lacrosse and went on the play lacrosse at the University of Maryland and the University of North Carolina respectively. John graduated from DeMatha Catholic High School in 1964. He attended the University of Maryland on a four year football scholarship and graduated in 1968 with a Bachelor of Arts degree. His wife also graduated from the University of Maryland. He attended George Washington University Law School and graduated in 1972 with a Juris Doctor degree. He passed the bar exam on the first attempt and was admitted to practice law in Maryland in 1972 and in the District of Columbia in 1974. He was a member of the National Honor Society in high school, Dean's List in college and a member of the Phi Alpha Theta Society in law school. John is a Life Fellow of the Maryland Bar Foundation, an organization that admits members who have, during their professional, public and private careers demonstrated outstanding dedication to the welfare of the legal profession and to the community and the maintenance of the objectives of the Maryland State Bar Association. He is also a member of the Million Dollar Advocates Forum which is a national organization whose membership is limited to attorneys who have either obtained a verdict or settled at least one case with a cash value of at least one million ($ 1,000,000.00) dollars. John has accomplished that result multiple times. John was honored to be selected to the Plaintiff Personal Injury section of Maryland Super Lawyers 2008 magazine and several such publications thereafter which is published annually by Law & Politics and the publishers of Baltimore Magazine. To be included in Super Lawyers, one needs to be nominated by other lawyers or selected from an independent statewide candidate search, evaluated by a panel of peers in their primary practice area and thereafter selected based upon total points obtained in the process. Only 5% of lawyers statewide are included in Super Lawyers magazine which includes all areas of the practice of law. John has the highest rating possible by Martindale-Hubbell Law Directory and is a member of their Bar Register of Preeminent Attorneys which is limited to attorneys who have demonstrated the highest level of legal ability and adherence to professional standards of conduct, ethics, reliability and diligence. He has been a guest lecturer at various continuing legal education programs. John also has been an arbitrator on hundreds of cases where he has been chosen by both defense and plaintiff attorneys to render verdicts on personal injury cases based upon evidence presented. John is a member of the Maryland State Bar Association, the Prince George's County Bar Association, the District of Columbia Bar Association, the American Bar Association and the Maryland Association for Justice. He is admitted to practice law in Maryland, and the District of Columbia. He is admitted to practice law before the United States Supreme Court as well. On the County and State Bar Associations he has served on several committees including the Peer Review Committee, Ethics Committee and Tort Law Committee. It is important for attorneys to give back to the community in which they practice. John has served as a City Councilman for the City of New Carrollton, City Attorney for the City of New Carrollton and Community Recreation Director for the City of New Carrollton. He has volunteered as a football and basketball coach for the Boys and Girl's Clubs in the communities where he has lived. He has also coached a nationally recognized AAU basketball teams and has brought those teams to five separate national tournaments, actually placing third in the nation one year and second in the nation another year among more than 70 teams competing each year. He also served as the attorney for DeMatha Catholic High School for several years. He has served as a member of the Democratic State Central Committee for Prince George's County. In 1976 he became an elected delegate to the Democratic National Convention. Early in his career, John was an Associate County Attorney for Prince George's County. He then became the Executive Director of the Prince George's County Consumer Protection Commission. 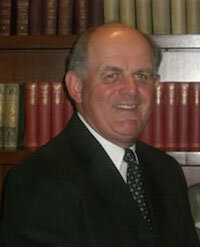 Thereafter he entered the private practice of law and has been in private practice since 1974.